So, all of this to say that I’ve been thinking about this quite a bit and I am more and more convinced that this – mixed ability grouping, no more tracking – is the way to go. What I’m struggling with is at the high school level. Can it be done? Should it be done? Has/Is it done? I think the answer to all of these questions is yes, it’s just that because I went through a tracked system and it « worked » it’s a slow process to change my mindset on it. What are your thoughts on ability grouping vs. mixed ability grouping/detracking? As you can probably tell, Dylan Wiliam’s presentation had a small effect on me (and by small I mean big). This time aroud it is the process of Teacher Learning Communities that I am pondering. It’s something, without ever having heard about before, that I believed was something that we needed to do- focus on our teaching practices. 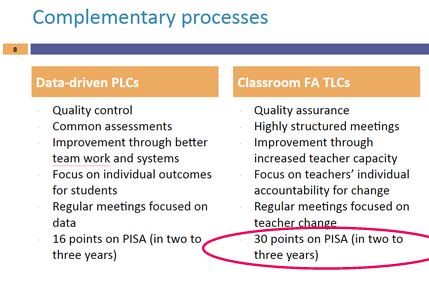 The focus of PLCs are on student outcomes and data, whereas TLCs is about changing our teaching habits, notably with regard to formative assesment practices, and improving on them through regular meetings and accoutability to other teachers (not supervisory-ish people). What struck me was that even if we focused on teacher practices, student outcomes improved significantly (see « 30 points on PISA »). TLCs are something that I would like to formally get going in our board. The fact that I now have some backing (i.e.- Dylan Wiliam’s presentation and some data) for my previously personal view, I feel a little more confident in putting this idea forward. Any thoughts on TLCs? Ouch. This statement was shared by Tracey Zager during ShadowCon (the video of her talk should be up at some point). Part of her message was that we need to address these teachers’ « relationship » with math so that the content knowledge and pedagogy we work hard to develop within them actually has a chance to be put to use. Anxiety and stress doesn’t only block brain power in students, but in teachers also. I need to work to actively address and reduce the stress and anxiety in the « 63% ». I don’t remember if that was the call to action by Tracey during her talk and I don’t feel like reading it on the ShadowCon site because I am making this my call to action. Kristin Gray gave a talk (with others) at NCSM that I attended. The presentation was about Number Talks. Again, this was something that was not new to me nor something that I haven’t been suggesting to teachers. What the session did do however, was give me a professional development framework that could be used to get the routine into classrooms. It also has also given me a sense of urgency to promote Number Talks and other number sense routines to teachers. The « how » is my big question. How do I push the idea of Number Talks and other such routines without making it seem like I’m pushing but rather that the teacher discovers them? Students define what is important. It’s still not easy, but I think I am starting to get it. The image above is my latest attempt. 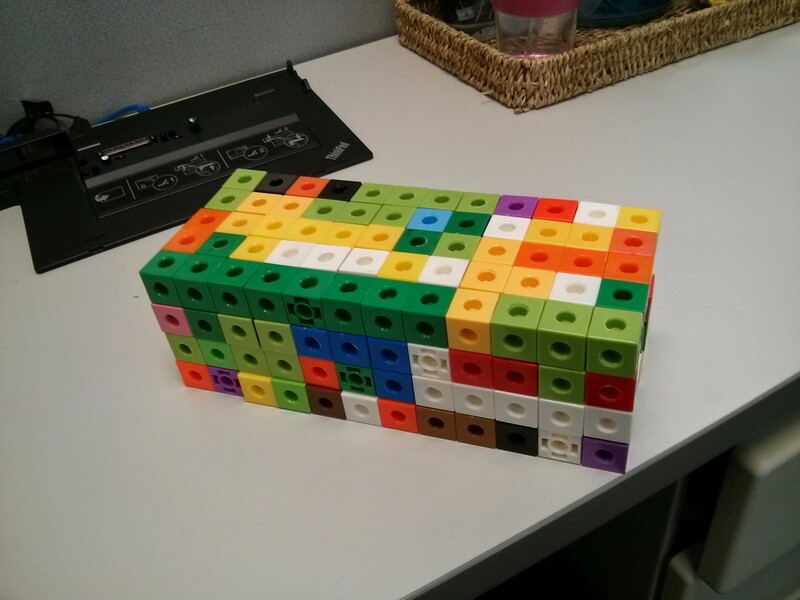 I presented the actual rectangular prism constructed of unifix cubes to a group of students that had never formally explored the concept of volume. The question was « How many cubes are there? »- simple, clear and accessible start in my opinion. « Too high? Too low? Just right… why? » was my next move- I think this fits into the « guessable answer » part. I then had students figure out how many cubes there were however they wanted to figure it out- this was suppose to be the « Students create a repesentation ». What was fun was that there were different ways of getting the same answer and all the ways used by the students led to the conceptual understanding of « area of the base x height » to find the volume. We didn’t have enough time at that point to get to the last parts; however, I was pretty happy with the overall outcome. Creating these problems/situations and getting it right is a challenge (and I kind of like it). I’ll keep trying to do that and my next step is trying to modify existing problems found in textbooks and other ressources to make them better. In assuming you don’t have magic eyes that can actually make out anything in the image, here is a better look at Alex Overwijk‘s course plan (grade 10). What you’ll notice is that the same concept (i.e.- solving linear equations and quadratics, the green dots) is explored multiple times during the course through different activities – hence the « spiralling curriculum » (the activities are listed on the second page). It has been designed so that with each activity relating to the concept, the concept is explored with greater complexity and understanding. To get a taste of what kind of « activities » we’re talking about here, check out Fawn Nguyen‘s post on Barbie Bungee. Fun, engaging activities that lead students to mathematize situations and to explore the same concept more than just once during the course. I see win, win, win and win. 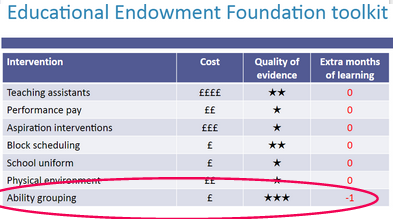 Alex also shared that achievement, student attendance and retention of learning over the summer is up- more good. What or how could this look like at the elementary level? This question makes me feel like I’m at the entrance of the rabbit hole in Alice in Wonderland… any body want to jump in with me? What sort of things are you thinking a lot about lately with regard to math and the teaching/learning of it? Quelle lecture inspirante! J’apprécie beaucoup ta réflexion et la façon que nous amène aussi à réfléchir! Merci Julie! Si nous avons une occasion, j’aimerais bien en discuter de vive-voix afin d’approfondir ma réflexion et ma compréhension des éléments dont j’ai fait mention. I love that you’re taking risks and trying things out. Regarding your activity with the snap cubes and volume, it sounds like you’ve got the right idea. As for the last part where students define what is important, they might not know (at first) how to illustrate what was important. It’s our job as teachers to highlight the ideas, processes, and reasoning they’ve already shared and (possibly) prioritize it for them at first. It’s always a work in progress and I can see how you appreciate that. Hi Andrew. I truly appreciate the feedback. I agree with you for the « last part ». I work hard to try not to do the work for the students, that is, make the connections for them. Rather, I try to make their work and ideas explicit in order that they can see the connections. Through questions, I try to « provoke » the emergence of the concept(s) that I am aiming for. Its like a chess match- a work in progress (as you mentioned)- we get better, there is not an end, each new situation forces us to make decisions and we learn from our experiences. Thanks again!